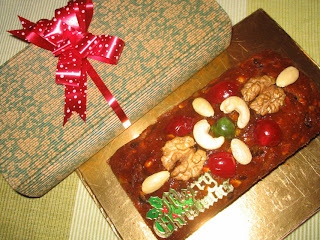 Fruit cakes are often associated with hard, dry texture and overly sweet. Sam's improved version of his Christmas Fruit Cake is light, soft and moist. It is also healthier too! With oil used instead of butter, loads of fruit and nuts, packed in a beautiful gift box, Sam's Light Christmas Fruit Cake makes a great gift this christmas! THEY whip up delicious hotel-standard cakes, cook for private dinner parties and even make their own chocolate truffles. They are not your typical housewife, but young, hot-blooded men. All are under 25, with the youngest only 16. Whlie others their age may be spending their weekends playing computer games or soccer, these guys are getting busy in the kitchen. Many have turned their hobby into a lucrative business - either online or through word-of-mouth. Such as Mr Mike Lau, who runs Creme Confections online. He specialises in cheesecakes and chocolate cakes. Mr Lau said: 'For me, cooking runs in the family. My mum used to run a food stall and now, she's semi-retired. Mr Lau, 22, has a diploma in culinary skills from The Singapore International Hotel and Tourism College (Shatec) and has apprenticed at Justin Quek's La Petit Village and Emmanuel Stroobant's Saint Pierre. 'I started cooking and baking for friends and family when I was 15. Now, Mr Lau bakes about 20 cakes a week - each costs between $35 and $50. He declined to reveal his profits, but said that he is confident that 'if I set up shop and sell cakes full time, I will have the orders to sustain it'. His family has offered to help him financially and a cousin even volunteered to help with deliveries. While Mr Lau is lucky to have support from his family, Mr JuliusChen, who sells chocolate truffles under the brand Julius Truffles, had a harder time convincing his. The 22-year-old NUS sociology student said: 'I think they were worried that it would affect my studies or that I wasn't going to gain anything from this hobby. Now, he earns about $800 on good months, and $200 on slower months. The bulk of his business comes from friends and family. But is baking befitting of a man? Besides baking carrot cupcakes, fruit cakes and cheesecakes, the 22-year-old Singapore Poly food technology student also conducts workshops to teach creative bread-making techniques. The guys say satisfaction comes from watching their friends enjoy their masterpieces. 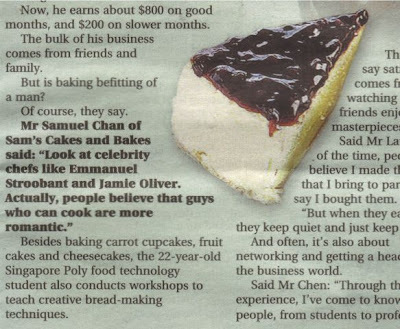 Said Mr Lau: 'A lot of the time, people don't believe I made the cakes that I bring to parties. they say I bought them. And often, it's also about networking and getting a headstart in the business world. Said Mr Chen: 'Through this experience, I've come to know a lot of people, from students to professionals, and even, some high-society people. 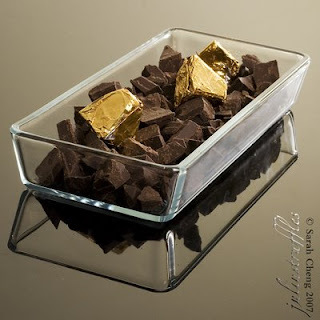 Chocolate, in a way, brought us together. He has also formed a network with fellow male bakers. Mr Chen has even collaborated with some of them and added them to his website, forming an online community. But not all have made a business out of their hobby. For some, food remains just a passion. For teenagers Jonathan and Sean Gwee, dabbling in cooking is an enjoyment that has helped them bond. Said Jonathan, 18, a first-year medical student at NUS: 'I do other things like play games and all that too, but cooking is my passion. His brother Sean believes much can be improved in the local dining scene. Said the 16-year-old who is sitting for his O-Levels this year: 'I would like to change the misconception that fine dining is all about being high class or that it's only for the rich, but really, it's an exciting alternative that's worth it. 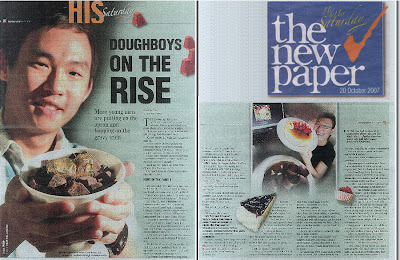 Singaporeans who have tried these young men's creations say they are surprised at these homegrown talents. Said Ms Amelia Koh, 35, a sales manager who has tried Mr Chan's cakes: 'I was very surprised when I found out that he's so young! Volcs from Julius Truffles, Rich Blueberry Cheesecake from Sam's Cakes & Bakes. The journey of Sam's Cakes & Bakes was never an easy one to start with. From an online catalogue to a bakejournal with gallery, from an online bakeshop to an online educational bake journal. I still remember all the difficulties throughout these times. All these changes have got to do with the people that I have met and networked throughout the past 4 years. In cyberspace, many virtual relationships are formed. Be it friendship or business partnerships. A lot of trust is involved as physically both parties do not know each other at all. I never believed that virtual relationships can last, let alone virtual business partnerships relationships. Not until Julius of Julius Truffles came along. What started out as an invitation to conduct chocolate courses for me turned out to be an unexplainable friendship being forged. I remember the first time we chatted was through Friendster about how we were both doing a cooking hobby business, and how we had always dreamt of opening our own place one day. Upon seeing my then geocities website, Julius offered to revamp it for me onto blogspot, inclusive of all the graphic designs. Why did he help me? I did not even know him physically. On further conversing with him, I started to see that there were similarities in the way we dealt with our passion. The passion for creating food. Today, what you see in the pictures are how we have both progress over the years, showcasing our products as compared to the past, when it was all about perfecting the right recipe. We have moved far ahead of our time, and suddenly I feel that yes, this is what it really means to be passionate. Note: The Gingko Nut Bun is on the left side. Thanks to Zorra of Kochtopf for her invitation to participate in World Bread Day 2007. This year, I have decided to share with you a recipe that I taught recently at a Baking Demostration. Gingko Nuts have been used widely in Asian cuisine. Some of these include: Japanese Chawanmushi (Steamed Egg), Teochew Au Nee (Yam Paste Dessert). In the past, the fresh Gingko Nuts have to be first smashed open to remove the hard outer shell covering. Sometimes, there is a bitter centre to be removed. After which, the Gingko Nuts are boiled either in water or a sugar syrup to soften it. These days, vacuum packed and canned Gingko Nuts are readily available and this has reduce a lot of preparation time. Happy World Bread Day! If Gingko Nuts are not available in your country, you can replace it with any other nuts available. 1. Place all the ingredients in bowl except butter. Knead till the side of the bowl is clean. 2. Add in butter and knead till well developed. Add in the Sliced Gingko Nuts. 3. Round the dough and rest for 30 minutes. 4. After resting, turn the dough bottom side up and punch down to flatten. Divide the dough into 21 X 20 g pieces. Roll the dough out and wrap one whole Gingko Nut. Place 3 of the dough together in a baking cup on a baking pan. 5. Proof bread till double in bulk, approximately 1 hour. 6. Preheat the oven to 200C. Brush the surface lightly with Egg Glaze. 7. Bake at 200C for 12 to 15 minutes until golden brown. Brush with oil when baked to give a glossy finish.